Barbara Jean Hinkle entered this world on February 18, 1927 to Louisa and Cecil Hinkle at Wichita, Kansas. Barbara’s journey in life taught her many life lessons at a very early age. She never considered the bumps bad. It was just a way of molding her into the woman she became. Her grandparents were E.B. and Neva Sitton. She fondly called them Do and Granddad. This special time was known as the Dirty Thirties and once again her life was very affected by the depression, but she was very loved by Do and Grandad. Barbara arrived in Oklahoma from Texas with her grandparents shortly after Black Sunday. In 1936 they moved into a sod ranch house built in 1895 which was located on Kiowa Creek. There she began her school career at Blue Grass, a one room school house. Barbara had a gift for writing. She told many stories for us to enjoy about her life. She always felt that the hard times were inner woven into a love story about the love of a step grandfather and grandmother for a foster child they dearly loved. This type of love enabled Barbara to have a wonderful life where she flourished – under the Sittons loving care. Her grandad loved to sing his favorite song to Barbara and Neva, his wife, “Two Girls in Blue”. In 1936 the search for a permanent home was ended on the Y-Bar Ranch. Vernor and Barbara Bockelman were married April 20, 1945 at the Methodist Church Parsonage in Ozarka, Alabama. A favorite scripture was “Husbands, love your wives, even as Christ also loved the church, and gave Himself for it. Ephesians 5:24. Their marriage is a testimony as they have completed 73 years of marriage. Barbara did drop out of college in 1945 but four children later, Barbara and Vernor decided she should get a college education. For her, an education was the best insurance that she could have so she enrolled at Northwestern State University graduating with a degree in secondary education specializing in English and Journalism. Barbara taught English at the senior and junior high levels for 13 years. Barbara had high educational goals and expected each of her children, Pamela Jo Sherrer, Carol Jean Bockelman, Kathy Louise Diacon, and Chris Earl Bockelman to graduate from college. Barbara loved the period of her life when she was encouraged to become a Cowboy Poet. Her various travels to many Cowboy functions allowed her to share what she has written. She shared that stage with variety of story tellers- Baxter Black being one of her favorites! Soon her stage became the classrooms of children and her own grand kids. 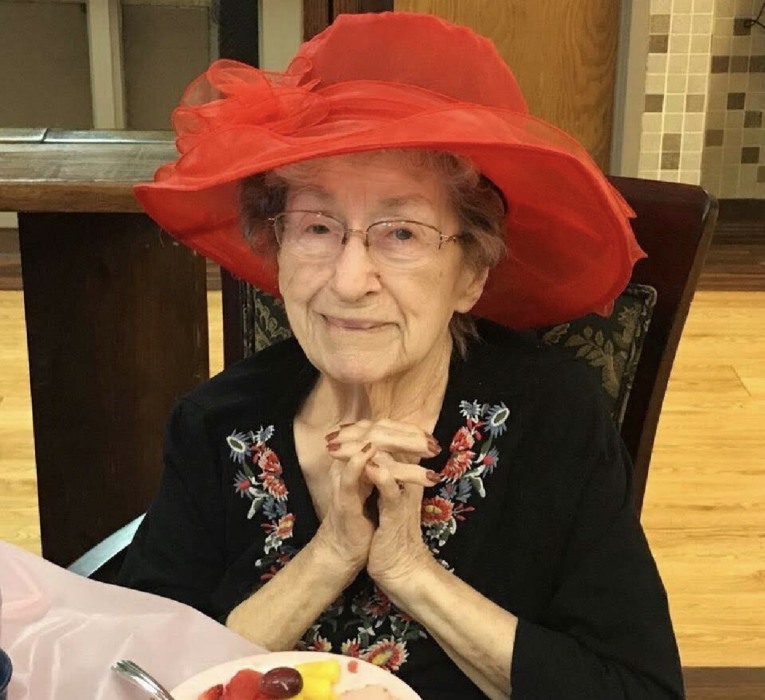 She loved doing that because she often remarked out loud – “how can an only child and her true love have 34 grandchildren. It is amazing!” Truly her quiver was full from God’s amazing blessings. There are 11 grandchildren: Tara, Lindsay, Monica, Jeremey, Rebecca, Brendan, Claudia, Tobi, Celeste, Grace, Andrew, and Kristin. In addition to 11 grandchildren there are 23 great grandchildren. “Kindness pays!” That is the lesson she taught us all.